The phrase “latchkey kid” was a popular one among my generation — the first where many families boasted two working parents. Coming home from school to an empty house was a pretty common occurrence for many of my school friends. However, thanks to smart door locks, today’s latchkey kids can dispense with the key entirely and parents can dispense with the worry over whether their children made it home safely! The convenience offered by smart home locks doesn’t end there. For families in particular, these locks have plenty of use cases that can make your life run more smoothly. Who doesn’t want that? Read on to learn about how smart door locks can help you, and see how easy they are to install. Smart door locks, a lock enabled with either a WiFi or Bluetooth connection, will open using just your smartphone (or in some cases, a keyfob or touchpad) in addition to a standard key. Smart locks pair with your phone and turn it into a digital key — which is used to identify who you are and ensures that you are authorized to open the door. At its simplest level, a smart door lock eliminates the pain point of fumbling in your pockets or digging to the bottom of your bag for your key. You just need to have your smartphone somewhere on your person for the door to unlock. Smart locks can be controlled remotely. No more worrying about your child losing their key or getting home before grandma arrives from the airport. You can unlock the door from anywhere you have an Internet connection. Even if you’re just upstairs with the baby but can’t remember if you locked the front door, you can open the app and remotely lock it without disturbing your bedtime routine. No need to carry keys. With a smart lock, keys become a thing of the past. No one need carry them at all — as long as they have a phone. For children without a smartphone, a keypad or keyfob gives them easy access to the house. Having no keys also means no need to worry about keys falling into the wrong hands or hiding a spare under the doormat. You know when the door is locked or unlocked. Does your teenager always forget to text you when they get home? Or do you often drive off only to turn around a few minutes later to go back and check if the door is locked? 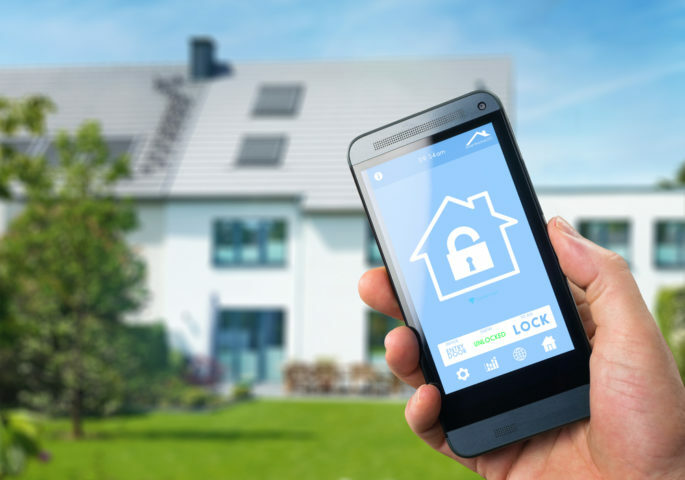 Most smart door locks have apps that contain a history, allowing you to look and see when the door was locked or unlocked and by whom, as well as check on its current state. You can digitally send “keys” to people. From the plumber to the babysitter, as long as they have a smartphone, you can grant them access to your home remotely. Send an e-key over the Internet that you can revoke at any point or set to expire after a certain amount of time. This means no more hanging around at home just to let someone in. You can see on your phone when they arrived and when they left, plus you can make sure they locked the door behind them — and do it remotely if they didn’t. You get a smarter home. Smart door locks can sync with smart thermostats and other connected devices in your home. This means you could have the lights shut off and the thermostat set to an energy-saving mode when you lock the door as you leave, and have them do the opposite when you unlock the door as you come home. You can even set up different scenarios for different people — because the lock knows which family member has come home. Additionally, you can pair a WiFi-connected camera with a smart door lock so you can easily see who is accessing your house at any time. Of course all of this sounds great, but what’s it like in real life? I recently installed a Kevo smart door lock (2nd Generation) in my home, and I can tell you it’s been a real game changer for my family! Arriving home and just touching the door lock with my finger to unlock it is so liberating — especially when my hands are full and my son is bouncing on one leg desperate to get to the bathroom. You can also lock it with just a touch of your finger, as long as you have your phone somewhere on you (in your purse or pocket is fine). If you don’t have your phone, you can lock the door by tapping it 3 times. Installing it was surprisingly simple. I’m not very handy and did it in about 20 minutes. The instructions are very clear, and there’s even a little sheet of paper where you can line up the included screws to make sure you’re using the right one for the right application. The app walks you through the whole process with a very detailed video also. 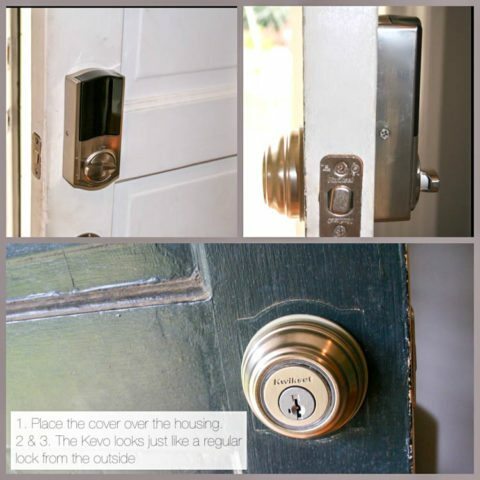 If you’re installing the Kevo smart lock in place of an old door lock, all you need is a tape measure and a screwdriver. Step #2 – Once the main lock is installed, you attach the housing with the interior manual lock to the inside of your door and put in the battery pack (it uses 4 included AA batteries). This means you can always manually unlock and lock the door from inside the house — no smartphone required. Step #3 – Next, you “teach” the Kevo lock the orientation of your door by pushing its calibration button as you insert the batteries. Now it knows when the door is opening or when it’s closing. Step #4 – Finally, you pair the Kevo smart door lock with your smartphone. Now you can lock and unlock your door just by touching your finger to it (as long as you have your smartphone on you). I gave a Kevo fob (sold separately) to my 8-year-old son for when he gets off the bus. (I’m home, but it gives him a sense of accomplishment to unlock the door himself!) The advantage of the fob over a key is that he doesn’t need to take it out of his bag and unlock the door. He can just walk right up to the door, touch the lock with a finger, and he’s in. This also means he won’t lose it, as he most likely would with a key — because he never actually has to touch it or remove it from his bag. Using the Kevo app is great when you have a moment to plan ahead. For example, I can unlock the door while sitting in my car. This has been quite useful when I have a car full of groceries but my daughter needs to get in the house quickly. I can let her out of the car first, unlock the door remotely so she can get in, and then proceed to unload the groceries at my leisure. It’s also great when lying in bed at night, as I can check if I locked the door — and lock it if not. The Kevo is Bluetooth-enabled, which means it has a limited range, but I’m able to control mine from about 20 feet away no problems. You can upgrade and get the Kevo Plus Gateway, which allows you to lock and unlock your door remotely wherever you have an Internet connection. The touch feature is the big winner in our household. While just touching the door to open it is much quicker than using a key, or even a keypad, for us it’s the locking feature that’s been the most useful. Our door doesn’t lock automatically behind us and we are always in a rush to go somewhere. Stopping at the front door to rummage through my purse for my keys to lock the door is a pain point — even more so when I have to stand there and wait for the children to leave first before I can lock up. With the touch feature I can just pull the door behind me and tap the lock, or have the children triple-tap it when they’re the last to leave. The other feature of smart door locks that we’ve enjoyed is the ability to send eKeys to people. My parents came to stay with us last weekend and rather than unhooking my key from the ring to give to them, I just sent my dad a “key” directly to his smartphone. Kevo lets you send eKeys for free — which is better than paying to get a key cut, and you can restrict access and revoke it remotely! For example, I sent my cleaning lady a key that lets her in the house on Tuesdays between 8 a.m. and 11 a.m. Kevo eKeys eliminate the need to hide keys under doormats or fake rocks, or change the locks if there’s someone with a key who you no longer want to have access to your home. The only problem we’ve encountered with our magical lock (as the kids call it) is that for some reason, whenever my husband walks through the door he activates the lock feature. We think he must be brushing it somehow and it’s ended up bashing the door frame a few times, or locking him out when he didn’t want to be. But we’re working on training him to be more careful!